Share your story about another local woman who has helped build you up during a live KVMR broadcast event! Participate in the She Builds Me Up Social Media Campaign today. She Builds Me Up Social Media Campaign Kicks off Today! 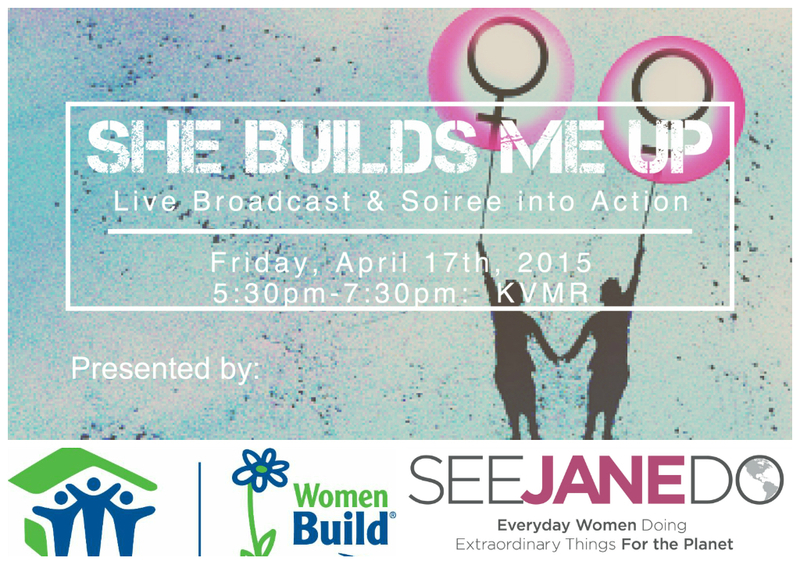 In celebration of Women’s History Month and the kickoff of Women Build 2015 Nevada County Habitat for Humanity, Lowe’s Women Build and See Jane Do are thrilled to launch the She Builds Me Up social media campaign and celebratory event on Friday, April 17th, 2015 at KVMR, 120 Bridge Street, Nevada City, CA. She Builds Me Up is about women supporting women and girls and honors the extraordinary women in Nevada County who go above and beyond to lift up their fellow sisters. Tag you’re it! Women are encouraged to tag and acknowledge their favorite local sheroes on Facebook and Twitter or email your story to info@seejanedo.com. Following, the public is invited to commemorate these exceptional women and hear their stories at the She Builds Me Up wine reception, 5:30-7:30PM and via a live broadcast on KVMR FM from their community room from 6-7PM. Special guests will include Nevada County Habitat for Humanity homeowners and Women Build team members. 1. Tag and acknowledge another local woman on Facebook who has helped build you up. The Women Build program empowers women in Nevada County to build safe, healthy, affordable housing for women and families. Learn new skills, give back to your community, network with other women, and help local women and girls. Be a role model and have a great time doing it! Nevada County women have a strong stake in making our community a better place to live for our struggling sisters and their families. We can and will make a significant impact on an issue that is important to all of us, and in the process lift up our entire community. Through Women Build, fundraising & volunteer teams, sponsors, and homeowner partners come together for a cause. The groups work side by side to construct houses, help Habitat increase its building capacity, and change lives through home ownership. Sari Townsend, a single mother of four children was raised in a nomadic family that moved about every 11 months. She never had a home base to or a sense of community roots. By the time her eldest was 12, her family moved 13 times, at one point living in her sister’s garage. Tradition is very important to Sari. Moving often didn’t allow her to keep the meaningful things that form a family identity, like children’s crafts, school projects, report cards, keepsakes, and heirlooms. With a forever home, Sari and her family will finally have space for their traditions, a place to come home to, and a place where memories and cherished possessions will find sanctuary. “Moving often is exhausting, expensive, and each time it broke my heart. Having nothing to show for my money and living in a place where the kids can’t safely play outside has kept us from thriving. Home is where the heart is, and our family’s heartbeat will be stronger when we have a permanent safe haven. We thought owning our own home was an impossible dream, but Habitat will make it come true. ” Sari looks forward to her home being the hub of tradition for future generations, providing stability, security, and permanence for her children and grandchildren. Melissa Essex moved to Grass Valley from Sacramento twelve years ago so that her son, now 16, would grow up in a good school system. She is a single mom living paycheck to paycheck in an old Victorian that is run down, riddled with mold, and expensive to heat in the winter. Rent is high and utilities are astronomical. She’s worked at her job at Raley’s for seven years and loves it (just got a promotion! ), but with her expenses making ends meet is a struggle each month. Thoughts of owning a home or saving for the future were a pipe dream until she learned about Habitat. Nevada County Habitat for Humanity builds homes and neighborhoods in Nevada County, CA. We rely on the support of donors, volunteers, faith-based communities, and businesses located throughout Nevada County. See Jane Do is an award-winning social change media & event productions organization that empowers everyday women to be a hero in their own lives and provides tools to put Passion into Action. We capture the stories of everyday women dong extraordinary things and utilize the power of story to create positive change. Real Women. Real Solutions.